Reveal up to 5 cards in HQ to the Runner. Gain 2credit for each card revealed. When Miranda Rhapsody showed up with a teacup giraffe, suddenly everybody wanted one. "Hey, boss, that card art's ready." "Looks pretty good... but it's not edgy enough,"
"Yeah, needs more gritty cyberpunk." "But it's a cute tiny giraffe, it's not supposed to-"
"Put some wires or something in her other arm." "But.... uhh... okay, sure, I guess. Why not." I love this card for several reasons. First, as already mentioned, it's a solid econ card for Jinteki, something they don't get all that often. Secondly, and most people consider this a downside, you have to reveal your entire hand to make it the most effective. And while it's true that this can be awkward for Jinteki, it also opens up a lot of great plays that exploit the information given to the runner. The obvious one is to show a hand full of nasty traps. The runner won't be going there any time soon, so you have a bit of breathing room when you do get some agendas in HQ. The other, I think, has the potential to be even more powerful, albeit somewhat janky/risky. Show them a hand full of agendas. 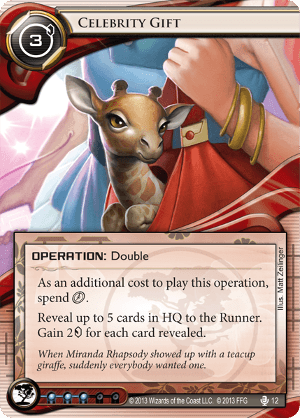 With Celebrity Gift you're basically selling information to the Runner for , which might sound a bit questionable at first due to Netrunner being all about information, but that would be ignoring how much Netrunner is just as much about misinformation. This is one of my favourite cards in the game because it is just useful, intelligently designed, game-changing fun. And, with it now being implemented into the Revised Core Set, anyone will be able to use this cheeky sod right out of the gate. Looking at the basic fundamentals of the card, Celebrity Gift costs 3 s and takes two s to install; as a in its lowest form is a , let's go with the idea that Celebrity Gift is going to cost you 5 s. Because of this, you're going to need to reveal at least 3 cards from your hand in order for this card to be worth playing, although, realistically, you're probably going to reveal your entire hand because, well, why wouldn't you? If you do this, you will gain 10 s from 2 s, which is crazy. This allows for Celebrity Gift to be a big economic benefit to Jinteki -- it's home faction -- as well as whatever other faction you're likely to shove it into, although this is probably much less worthwhile due to the influence cost and your option for other, cheaper alternatives such as Hedge Fund, Successful Demonstration, or Medical Research Fundraiser, even though I would recommend Celebrity Gift for more than just its economic benefit. Celebrity Gift's best feature is that it allows you to seriously mess with the mind of your opponent, making them wonder what the hell you're actually planning to do with all that crap in your hand. Show them a hand full of traps? They'll avoid your HQ, which is good; allowing you to guard it safely or bung them wherever you like, making the Runner think twice before they run anything, which is really good. Show them a hand full of agendas? They'll rush your HQ, which is bad; unless you booby trap your HQ beforehand, which is good. Show them a mixture of both? They'll be considering either of the above, which is great; until you then install one of those revealed cards into a remote server, tearing their mind in two, which is fantastic. Celebrity Gift is all about screwing with your opponent and getting paid, two things that should never go underappreciated in Android: Netrunner. You're dangling a carrot in front of the Runner to get them to give chase, and when they do, you pull the carrot away and kick them in the face. Also, the artwork is adorable, goddamn. One of my favourite bits of design in the whole game, for several reasons. It's a strong, efficient economy card. Best-case, it gives you net 7 credits for 2 clicks - nearly as strong as a double hedge fund, and from a lower base as well. It balances out that strength with several interesting drawbacks. Most obviously, it's becomes rapidly less efficient if you have less than 6 cards in hand before you play it. There is also the possibility that you'll have more, agenda points in hand than you're comfortable showing the runner, leaving you both flooded and poor. The double click is a bigger ask for the corp than for the runner, and makes this a problematic turn one play. Most interesting is the question of playing it with traps like Snare and Shock in hand. On the one hand, you miss out on the runner possibly faceplanting HQ with a fatal Legwork. On the other, showing off your spiky hand wards off runs on the agenda points you hold in HQ or might hold later. There's also the possibility of revealing your use of an unorthodox trap such as Edge of World. For a corp which thrives on confusion, giving away info is a real cost. Celebrity Gift is a good example of the influence system at work - the card gets played where its use is most involved and interesting, not where it is strongest. Coming out of Genesis cycle, Jinteki sometimes felt a mass of gimmicks and tricks with nothing tying their use together. You had all manner of convoluted kill conditions, but lacked the money or defenses to pressure a wary runner into triggering them - weak ice was particularly harmful at a point where siphon abuse was its most rampant. This card, an actual efficient source of money, and Himitsu-Bako, a small, handy etr ice, marked a sea change for Jinteki, where the trickery started to get supported with solid cards. It has an adorable giraffe on the art. Nothing seals a CCG card as a fan favourite like furry little critters of doom. If the thematic justification for the effect, where Jinteki's publicity stunts give away their schemes, is a bit of a stretch, it's still quite clever. The card always makes me smile when I hold it in hand. Gift isn't as common as it was outside of CI these days, but it still stands up as a lovely card on its own merits, and worth thinking about for most Jinteki decks. It's one of Jinteki's best economy cards. Aside from Sundew out of Jinteki: Replicating Perfection, or horizontal Industrial Genomics: Growing Solutions builds, it's usually not convenient to use economy assets, since Jinteki's not that good at actually keeping runners out. If we're relying on operation economy, this is one of the stronger ones, netting 7 for two clicks - better than a turn of Melange Mining Corp. The reveal seems like a downside, but actually is usually neutral or even advantageous. You have access to lots of cards the runner doesn't want to hit, and you can use those to turn the reveal into an intimidation tactic rather than a concession. There are nuances to using it: the number revealed, and when to play it. You can reveal less than 5 and leave them guessing as to what else is there, but I always show the whole hand. Unless you're running a weird list, a good player will guess your capabilities already, so the raw economic efficiency will usually be more helpful than the slight possibility of surprising them. As far as timing, I'll pretty much do it any time I'm not flooded if I need the money. It's like Accelerated Beta Test - you've just gotta believe. Keep some traps, a decently taxing HQ, or change the contents of your hand, and it won't make a run much more appealing, even if you showed an agenda or two. No matter what you show, the runner will be closer to knowing where the remaining agendas are. You still have one click to use. Consider playing Gift and then overdrawing, especially with Jackson Howard if you have one out, so you can minimize the information the runner gained from your reveal. Special Report is a great card to have. It's just a strong and interesting card to use, and I hope they reimplement it post-rotation.